November 24 is Small Business Saturday, a “holiday” which encourages shoppers to patronize small, brick and mortar businesses. To celebrate SBS, the CCA is spotlighting one of the longest-running retails shops in Canton, 2910 on the Square. 2910 on the Square, established in 1999, is a unique retail shop featuring a wide variety of gifts, works by local artists, and many one-of-a-kind handmade crafts. The shop, located at 2910 O’Donnell Street, is woman-owned and operated by Canton resident Stephanie Fleishman. Stephanie, a Milwaukee transplant, has called Baltimore home for 28 years. She has 2 canine helpers, Winston and Ella Bella, who are crucial to selecting the stock, especially the pet toys. And, the customers love to visit with them, too. Here’s a glimpse into our recent chat with Steph. When did you open 2910 and why did you pick Canton? 2910 on the Square opened Mother’s Day weekend in 1999 on just the first floor of the building. (It now fills 2 levels.) At the time Canton was going through a renaissance; homes were being renovated and people were moving into the neighborhood. It was the perfect place to open a gift shop, as there were no places to find things for the self and home in the neighborhood. Tell us about the shop. The idea for the shop was to carry functional items for the house, ideally row homes. I wanted to bring “cool design” to Canton”. I started with jewelry, gifts for babies & weddings, and greeting cards. Items had to be reasonably priced and ideally MADE IN THE USA. Over the years, the shop expanded, adding humorous gifts for all occasions, Judaica, art glass and more. We also met customer demands by adding Ravens and Orioles merchandise, too. You have many “Made in Maryland” and Baltimore-centric products. Who are some of the local artists you feature and what are their products? We feature SOGH artwork by Shawn Theron, wonderful all natural soap made with Natty Boh beer, artwork by Jill Dombroskie, beautiful pottery by Donna Toohey, and ceramic trivets made by the students at the St. Elizabeth School. Popular edibles include Mouth Party Caramels, Annabelle’s Gourmet Dog Treats, and Fisher’s Popcorn. Linda Amtmann’s hand-painted bricks and wood panels featuring local scenes are some of the most popular items in the shop. We also carry a selection of Route One Apparel spotlighting the Maryland flag, and beloved Natty Boh items as well. What are you doing for Shop Small Saturday? We will be open all day for Small Business Saturday with goodies for our customers to enjoy while shopping. It is a great day as customers come out to support local merchants. Year after year we look forward to seeing repeat customers come in to shop. It is great to see them and catch up with them. We will also have a drawing for 2 $20 gift certificates to celebrate our 20th holiday Season! Of course, we do lots and lots of gift-wrapping as well. What can we expect for the Holidays? Can you suggest any must-have gifts? The Holidays are a busy time of year at 2910. Customers can find something for everyone on their list. The custom woods and bricks are always popular around the holidays. We have hand-painted crab shells and this year we are featuring some new artists and designs. You will find lots of ornaments with a Maryland and/or Baltimore theme. For those celebrating Hanukkah, we offer menorahs for children that can be customized with their names. We have Hanukkah candles as well, and everyone always seems to need a box of candles sometime during the holiday. We know you’re an active member of the Canton community. What are some of the ways 2910 has shown support over the years? 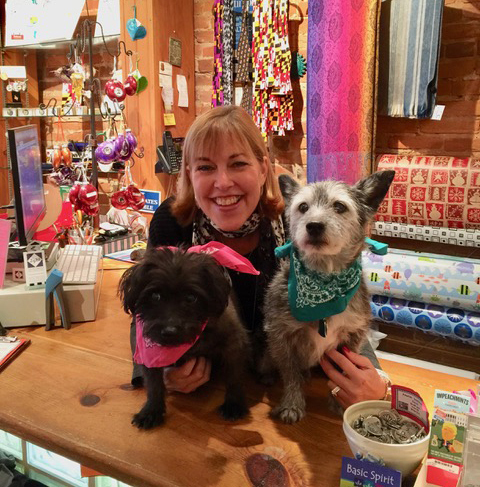 Everyone who has ever been in the shop has meet Winston & Ella Bella and knows of your love for dogs. Please tell us about your side project, Wings of Love, Kuwait. Two years ago, right before the holidays in 2016, I learned about Wings of Love, Kuwait. I was so moved by their mission that we chose them as one of our organizations for gift-wrapping donations during the holidays. One of the founders of the rescue came into 2910 in January 2017 to thank me for the donations we collected. As I learned more about the organization, I decided I wanted to volunteer for the rescue. In 2018, I started going on airport runs to meet the dogs coming over from Kuwait. I was hooked after my first 10-hour day. It was such a rewarding experience, I just kept volunteering. In March of this year, we had a 1-year-old female dog arrive from Kuwait who ended up having puppies 2 weeks after she arrived in Baltimore! The rescue desperately needed a foster for Roche and her puppies, and I had an empty basement, so I brought them home! Imagine 5, 2-week old puppies and a Mommy all at once. They were a handful to say the least. Fortunately, the founders of the rescue, as well as friends and neighbors came and helped me out over the next 11 weeks. I had never taken care of puppies before. It was an incredible experience! All of the puppies were adopted and now we are trying to find a forever home for Roché. What do you like most about living and working in the Canton Community? Canton has been my home since I moved to Baltimore 30 years ago after college. It really is Smalltimore. Through 2910 I have had to opportunity to meet so many wonderful people who live here or have passed through Canton. I get to walk to work every day and bring Winston and Ella Bella with me. Canton is home! Is there anything you’d like the community to know? If you haven’t stopped in 2910 on the Square, please do come in and say hi and introduce yourself. We’d love to meet you. We send a big THANK YOU to our neighbors and the CCA, for their continued support. We love being a part of such a vibrant and friendly community!